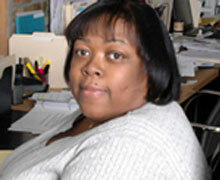 Mozell Baker is the Financial Assistant at LPCCD. She has worked for this company since March 2007. Her responsibilities include accurately recording and reporting financial information. Mozell also maintains accounts payable & receivable, payroll, general ledger, monthly income statements and balance sheets, bank deposits, financial statement, process invoices and check requests. She was raised in Manhattan and attended Sawyer College in Cleveland, Ohio, where she earned her Associate Degree. After receiving her degree, Ms. Baker returned to New York, and was employed by Chase Manhattan Bank, as a teller. There she supervised and coordinated activities for workers engaged in receiving and making payments, kept records of transactions and banks and similar financial institutions and accepted payments on loans. Her job experience includes work as a billing clerk, data entry and customer service, as well as nine years working as Accounting Manager at First Baptist Church of Lincoln Garden help with construction billing for 20 million Church Complexes. Ms. Baker also worked in the Finance Department part time for First Baptist Development Corporations finance department. The program offered a “one stops shopping” approach to the delivery of human services, with an ultimate goal to enhance and develop family economic stability and self-sufficiency, achieved through training, job placement, social services, counseling and treatment.